Implementation Science is the study of the creation and evaluation of active, evidence-informed strategies to ensure faithful implementation of evidence-based interventions. Active implementation (and related research) is becoming increasingly important, as service providers face growing pressure to demonstrate that they are offering effective and efficient methods of care. Active implementation involves planning and structuring activities to ensure that service providers put a program or intervention into place as it was intended. The Systems Improvement through Service Collaboratives (SISC) initiative has adopted the National Implementation Research Network (NIRN) implementation model, which outlines several stages and drivers to promote the successful implementation of a program or practice of known dimensions. This multi-level model also highlights the importance of expert implementation support and improvement cycles. It relies on the assumption that effective implementation of effective innovations will lead to positive client outcomes. You can read more on what happens in each implementation stage here. For more information on Implementation Science, visit the National Implementation Research Network's (NIRN) website. Implementation is a set of activities meant to bridge the gap between what is known and what is done. In simple terms, it is a rigorous, scientific step-by-step process for turning knowledge into new practices. Evidence-informed approaches are necessary in the mental health and addictions system for effective promotion, prevention, and early intervention, but they may be insufficient without consideration for the implementation process and a deep understanding of the context in which approaches are being implemented. Using an implementation-sensitive approach, (see diagram) means starting with an ‘Exploration’ of the current situation and challenges within a particular system, setting or community, before moving through a series of active implementation stages. It is at this early stage that an evidence-informed intervention is first identified. . This stage helps teams to better understand the current context or situation within a local system and then decide which evidence-informed intervention is best suited to the needs of that system. It also helps them to decide which intervention has the best opportunity for advancing successful approaches. Following the selection of an intervention, the group moves into the ‘Installation’ stage which involves planning for the identified intervention. Determining the core components of the intervention and preparing for how they will be implemented in the local context is a critical step of the Installation stage and in the overall Implementation process. As the group moves into the Initial Implementation stage, it is important to understand that striving to implement interventions faithful to their original intentions (maintaining fidelity) is desirable, however, it is important to adapt activities to specific situations and the needs of local communities, which ensures that the intervention remains relevant and meaningful. Initial Implementation allows an intervention to be tested on a smaller scale to help identify necessary tweaks or local adjustments. Through continuous refinement and quality improvement during the Initial Implementation stage, the goals of relevancy and meaningfulness can be most effectively achieved. ‘Full Implementation’ – the final stage – is reached only when the intervention is a cohesive and integrated feature of the local system. At this stage, our aim or goal is to achieve full sustainability of the intervention over the long term. To achieve this, it is important to consider and build in this goal during the implementation process. This is best achieved by assessing the readiness of communities to implement, and developing readiness where needed, from the onset of an implementation process. An implementation-sensitive approach also includes developing an Implementation Plan that takes into account the capacity (the skills, knowledge and availability) of the workforce, the environment, and processes at the organizational and system levels, and the leadership required to create and maintain system improvements over time. 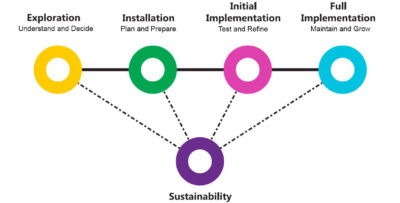 Building in mechanisms for assessing and supporting readiness also play an important role in the overall and long-term sustainability of the system change. Quality improvement (QI) tools provide a formal approach to improving processes of care, recognizing that in order to positively change system outcomes, we must also systematically improve system processes. By focusing on the analysis of a system’s performance, QI tools (e.g., process mapping, Plan-Do-Study-Act [PDSA] cycles) can result in increased efficiency and improved performance on many levels. The SISC initiative has incorporated several QI approaches and tools within our Implementation Science framework to support collaborative partnership development and the implementation of evidence-informed interventions. The SISC initiative acknowledges that successful outcomes require a combination of proven interventions and effective implementation techniques. There are many definitions of evidence-based practice; these are largely dependent on varying levels of scientific rigour. The SISC initiative incorporates a tiered definition of evidence to guide decisions about which practices to adopt throughout the Service Collaborative process, particularly in the choice of interventions at the local level. Evidence is defined as the integration of the best available findings from the external research world with clinical practice judgment/expertise and client preferences/lived experience. SISC’s aims are ultimately to improve access to treatment and/or transitions in mental health and addictions services, resulting in improved outcomes for children, youth, and their families. Therefore, SISC must start on solid ground by using the evidence and resources that are available. The SISC initiative is supporting local systems to improve coordination of and enhance access to mental health and addictions services for marginalized populations in Ontario by integrating a health equity approach. Service Collaboratives complete Health Equity Community Profiles and Health Equity Impact Assessments (HEIA), and use data on health inequities to inform decisions. The HEIA tool is being used at different phases of the Collaborative’s process, including while engaging members and during the selection of interventions for addressing the identified system gaps. Findings from the HEIA will be used to ensure inclusive representation to reflect the cross section of services and sectors that provide services to the high priority children and youth subpopulation(s) identified in the Collaborative’s Health Equity Community Profile and Community Needs Validation. It will also be applied to identify key agencies or individuals who can implement changes to address identified needs. In the SISC initiative’s use of developmental evaluation, evaluation is embedded within the Service Collaboratives to help bring ‘evaluative thinking’ to the process and facilitate data-based, timely feedback to support action. Developmental evaluation is not one specific method, but rather an approach that can be used to select the most suitable methods, types of data, or focuses. SISC’s evaluation methods include traditional logic models, performance measurement and also qualitative methods, like case studies. Developmental evaluation supports innovations and guides adaptation within complex environments. It is often used in response to complex issues that involve multiple stakeholders and large-scale change across systems. This complexity requires flexible evaluation methods and ‘agile’ evaluators who are able to respond to unexpected situations that will arise when innovations are implemented in dynamic systems.